Purchase 942 x 1200 pixel digital file by using the Buy Now buttons below. You will receive an email with the download link. You can use the link 5 times to download the digital file. Morning Prayers at the Ghats. 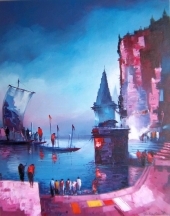 Like a true artist who’s not been afraid of trying his hand at almost every subject and medium under the sun, Dilip Chaudhury has metamorphosed into a sought- after artist with a niche skill of creating above all, subjects of abundant beauty and character with a strong sense of perspective. 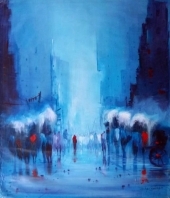 A touch of red in his paintings symbolizes optimism. 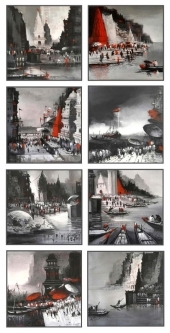 Dilip has executed truly riveting canvases, each of which has a unique story to narrate. They are not flat but have grandeur, movement, people and therefore, life infused into them. 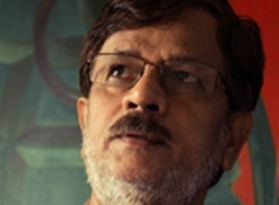 Sometimes Dilip uses his imagination to highlight the simple rickshaw puller of Kolkata. He creates stylistic compositions from unusual angles, which succeed in enthralling the viewer.